Following BJP ruled Union Government, the Himachal Pradesh Government has decided to implement the 10 percent reservation to the youth of economically weak general category in job and education institutions. 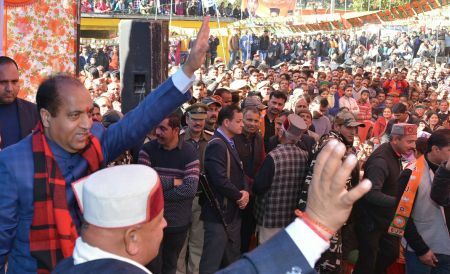 Himachal Chief Minister Jai Ram Thakur hoped that the reservation for economical weak section of general category would prove a boon to the economically weak families of general category as they would also get opportunity in jobs and admissions to the educational institutions. He said that the mantra of ‘Sabka Sath, Sabka Vikas’ of the Centre and the State governments has been further strengthened by with this decision. Ahead of the parliamentary election, the Union Government has mooted to give reservation benefits to economically weaker section in general category and amidst the criticism form the opposition government passed the Bill in the Parliament and paved way to give 10 percent reservation in jobs and educational institutions to the economically weak general category families. The reservation is not confide to a particular religion but applies to people from all religions. Under the new amendment to the constitution people with an annual income below Rs. 8 lakh and owning fewer than five acres of land would be eligible for the reservation.